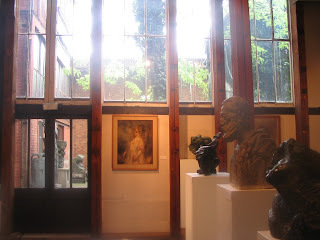 One of my favorite museums in Paris is the Musée Bourdelle. It is a beautiful little museum tucked away in Montparnasse, and was the home, gardens and atelier of the sculptor Antoine Bourdelle (1861-1929). Bourdelle was a great artist, and a pioneer of 20th century sculpture. He worked for a time with Rodin and there was mutual admiration between the two. He also taught sculpture. (Giacometti studied with him on and off for 5 years beginning in 1922). In 1924 Bourdelle was made a commander of the Legion of Honor. There is something very special about a museum that was once the home of the artist. You can almost picture him working and feel his inspiration. At the time of our visit there were few people in the museum and the very friendly staff were happy to tell us all about Bourdelle and his atelier. It’s exciting to visit a museum where the staff take such pleasure in the work. If you’re interested in the lives of the artists as well as the art work, I highly recommend you pay a visit. It is a lovely museum. Enjoy!